What is JSP? What is JSF? How are jsp and servlet related to each other? What is the difference between jsp and servlet? Is JSP a type of Servlet? Basically, a servlet is needed for hug request processing logic that contains lesser response generation logic. On the other hand, when greater response generation logic is needed along with less request processing logic, then it is important to use JSP. Servlets and JSP are two important Java server-side technologies that form the building blocks of all types of Java web frameworks. The differences between these two technologies form an important interview question. It is found that the fundamental concepts related with servlets and JSP is quite confusing for beginner as well as Java web developers. 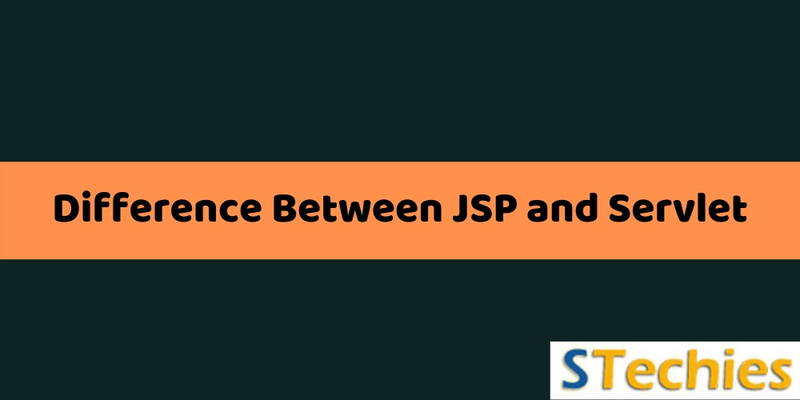 This article aims to highlight the main points pertaining to jsp vs servlet along with taking care of the definitions of servlet and JSP, the features of jsp servlets, the need for JSP and servlets, etc. Read on for a closer look at the world of JSP, servlet and JS. Given below is a comparison chart depicting the main points of difference related to jsp vs servlet. It is a Java based code and uses the java approach for functioning. It is a HTML based code and comprises of a tag-based approach. JSP is an interface that rest on top of Servlets. JSPs are basically extensions of servlets for minimizing the efforts of developers with regards to writing user interfaces with the help of Java programming. Writing servlet codes is more difficult than coding JSP as it comprises of html in java. JSP is comparatively less difficult to code as it comprises of java in html. Servlets play the role of a controller in MVC approach. JSP is typically a view in the MVC approach for the purpose of showing output. Servlets are faster than JSP. JSP takes longer than servlet as the first step in JSP’s lifecycle comprises of the translation of JSP to easy-to-decipher java code and then the compilation take place. Servlets accept all types of protocol requests. JSP accepts only http requests. In Servlets, it is possible to override the service() method. In JSP, it is not possible to override the service() method. In servlet, the session management is not enabled by default. JS users are responsible for enabling the same explicitly. Session management is enabled automatically in case of JSP. In Servlet, everything, including business logic as well as presentation logic, has to be implemented by developers in just one servlet file. In JSP, business logic can be separated from the presentation logic with the usage of javaBeans. Modification in case of servlets is time consuming as it incorporates the reloading, recompiling, restarting, etc. of the server. JSP modification is quick and easy to implement; only the refresh button has to be clicked. In Servlet, the packages must be imported atop the servlet. In JSP, the package may be imported anywhere- either at the top, middle or bottom. To order to run a Servlet, the entry of Servlet mapping has to be made into deployment descriptor file, which is the web.xml file, externally. In order to run JSP, there is no requirement of making an entry of Servlet mapping into web.xml files externally. Also, it is not obligatory to make an entry for the JSP file as a welcome file list. Executes within a web server of the likes of Tomcat. JSP programs are compiled into Java servlets prior to their execution. Once compiled into servlets, the life cycle of JSP becomes the same as that of a servlet. However, JSP contains an API of its own for the lifecycle. Receives HTTP requests directly from users and offers HTTP responses. Easier to develop JSP (in comparison to servlets) as it is similar to HTML. Custom tags cannot be built in servlets. A key advantage of JSP is that it can be used for building custom tags with the use of JSP API. There exists a separate package for writing custom tags that can be available in the form of re-usable components that have a lot of flexibility. Servlet has life cycle methods of the likes of init(), service() and destroy(). JSP presents life cycle methods like jspInit(), _jspService() and jspDestroy(). Servlet is written in Java, and has additional APIs that are specific to its kind of processing. Servlets follow all the techniques of Object-Oriented programming. JSPs make use of Javabeans within web pages. JSP is also supportive of Expression Language that comes in handy for accessing backend data that can be utilized with the help of attributes available in the request, page, session, application scopes, etc. when combined with taglibs. At the very first instance of the JSP being initiated, or whenever the web application starts, the servlet container compiles the JSP into a class that extends HttpServlet. This is used across the lifetime of the web app. The generated source code for the same can be traced back in the server's work directory; for instance, the /work directory in Tomcat. When the JSP is requested, the servlet container executes the JSP class so compiled and sends the output that is generated via the web server and across the network to reach client side. The output generated in HTML/CSS/JS is in turn displayed in the web browser. JSP technology is utilized for the creation of dynamic web application in a manner similar to Servlet technology. This technology is in the form of another web technology provided by Sun MicroSystem to assist the development of dynamic web pages shown on the client browser. JSP offers a tag-based approach for the development of java web components as well. JSP has .jsp extension. The jsp pages can be directly accessed from client system browser windows as they are contained outside the WEB-INF folder. JSP page comprise of html and JSP tags. In comparison to servlets, it is easier to maintain the jsp pages. JSP technology offers some additional features of the likes of Custom Tags, Expression Language, etc. JSP pages are not referred as programs as they contain tags only. The jsp pages are internally converted into servlets with the help of server containers. JavaServer Pages (JSP) are responsible for producing web pages supportive of dynamic content that helps developers include java code within HTML pages with the help of special JSP tags. These tags mostly start with <% and terminate with %>. Html tags in JSP produce static output while the JSP tags come in handy for developing dynamic output. The presence of JSP tags in JSP technology makes JSP create dynamic web pages. CGI was the technology that was put into use for the purpose of web application development. However, as CGI had some serious drawbacks, the servlet technology was developed by Sun MicroSystem. In due course, gaps and drawbacks started coming forth in the Servlet Sun MicroSystem technology; they required complicated java codes and thus failed to attract programmers. JS technology was developed to overcome the problems related to the Servlet technology. 4. Parsing/decoding HTML form-based data. 5. All requests for JSP are handled by simple Java threads. 6. JSP is scalable and presents easy integration with most other backend services. 7. It can help developers, content authors, graphic designers and web masters. A servlet refers to a Java class that is very useful for extending the capabilities of servers responsible for hosting applications. They use the request-response model for going about the act with high efficiency. Mostly, servlets are used for extending the applications that are hosted by webs servers. Servlets in java are known to respond to different types of other requests with the help of HTTP-specific servlet classes that are also defined by Java Servlet technology. Typically, java servlets are in the nature of programs running on the web or with application servers. They act as a distinct middle layer that links requests dedicated to any specific web browsers or HTTP clients, databases, applications found on HTTP servers, etc. Servlets help in the collection of inputs from users via web page forms, the current records present in databases or other sources for developing web pages dynamically. Basically, a Java application programming interface (API), a servlet runs on server machines. It intercepts the requests made by clients and is responsible for generating/sending quick responses. HttpServlet is a servlet that provides methods for hooking on HTTP requests with the aid of popular HTTP methods of the likes of GET and POST. HttpServlets can be configured to listen to certain HTTP URL patterns. These patterns are configurable in web.xml as well as Java EE 6 equipped with @WebServlet annotations. During web app startup or when servlets are first requested, the servlet container creates an instance of the same and retains it in its memory across the web app's lifetime. This instance is reused for all incoming requests that have a URL matching with the servlet's URL pattern. The request data can be accessed via HttpServletRequest and the response can be handled via HttpServletResponse. Both these objects are available in the form of method arguments with the overridden methods belonging to HttpServlet – for instance, doPost().Problem and doGet() with servlet. In case any servlet html code changes, the servlet will have to be recompiled, redeployed and go through a server restart. The recompilation is needed as response generation logic and request processing logic are coupled tightly. 1. Performance: Servlets get loaded as soon as the first request is made, it remains in the memory indefinitely. 3. Session Management: Servlet overcomes the stateless nature of HTTP. 4. Java Technology: Servlets provide network access, j2ee integration and database connectivity. JSF is a component-based method built atop the Servlet API as an MVC framework. The components are provided by JSF via taglibs that are capable of being used in JSP as well as other Java-based technology (view) of the likes of Facelets. JSF offers components through Facelets; these components are more suited to JSF rather than JSP. JSF offers impactful templating capabilities of the likes of composite components. This is in contrast to JSP that offers only <jsp:include> for the sake of templating. Being a MVC based framework, JSF offers FacesServlet as the only request-response Controller. Ever since JSF 2.0 was launched, JSP has deprecated as view technology, leaving behind Facelets. JSF helps developers by taking away all standard, cumbersome and tedious HTTP request and response tasks from their hands. This includes the gathering of user inputs, validating and converting them, putting inputs in model objects, invoking different actions, rendering responses, etc. JSF helps in creating JSP or Facelets (XHTML) pages for a JavaBean class and View to serve as models. The components belonging to JSF are used for binding the view with models in a manner similar to what ASP.NET web controls do. Additionally, FacesServlet utilizes JSF component trees for performing all tasks. It offers client-independent, component-centric development approach for developing Web user interfaces; in turn, it encourages developer productivity as well as ease of use. JSF simplifies the management and access of application data pertaining to web user interfaces. JSF manages the state of user interface automatically in between multiple requests as well as multiple clients; it goes about all tasks in a simple, unobtrusive and timely manner. JSF provides a development framework that is user-friendly for varying developer audience comprising of different skill sets. JSF describes benchmarked, standard architectural patterns for different types of web applications. 1.Servlet is basically html in java; on the other hand, JSP comprises of java in html. 2.Servlets run much faster in comparison to JSP. 3.JSP is capable of being compiled into Java Servlets. 4.In comparison to java servlets, it is easier to code in JSP. 5.JSP serves as a webpage scripting language that is useful for generating dynamic content. In contrast, servlets serve as Java programs that have be compiled previously and are responsible for producing dynamic web content. 6.In the MVC framework, a servlet acts as a controller while jsp acts as a view. 7.JSP is generally preferred in case low processing of data is required. On the other hand, servlets are best used in case more processing or manipulation is involved. 8.An important advantage of JSP programming over servlets is that it is capable of building custom tags that can be used for calling Java beans directly. No such facility exists in case of servlets. 11.JSP gets converted into a servlet and continues to look like PHP files wherein java can be embedded into HTML. Once you have gone through jsp servlet example and use cases, it will become easier for you to decipher the jsp and servlet difference points. The approach to jsp vs jsf can also be chalked out by understanding what a servlet or jsp is used for. Now that you know what is servlet and jsp, and figured out the difference between jsp and jsf and servlet, go ahead and sart using these methods with confidence. The questions related to servlet jsp are quite common in interviews and have to be handled with care. In case you have any further inputs with regards to what is jsp and servlet or the differences between them, do write back to us in the Comments section below. We shall wait to hear from you.